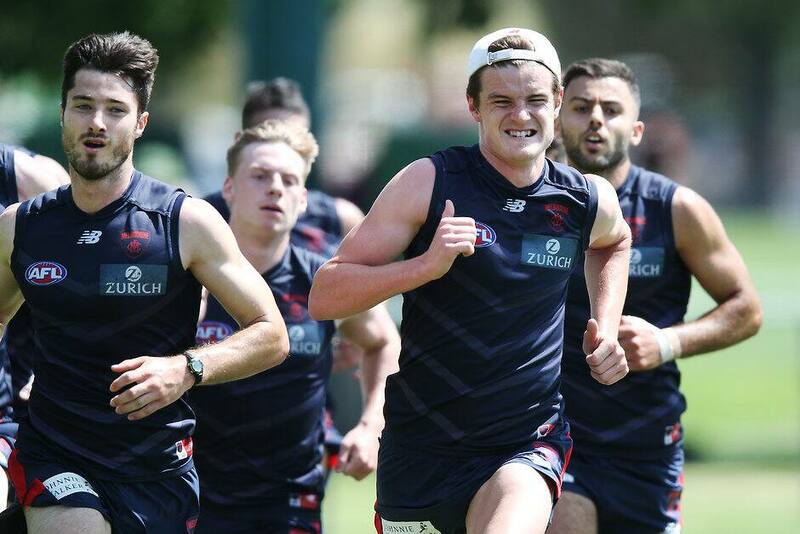 MELBOURNE'S players have endured a brutal running sequence in 35-degree heat as they wound up a two-hour training session at Gosch's Paddock on Friday morning. After training in hot and blustery conditions for nearly an hour and a half, the players put their runners on and got down to work in a running session led by sports science and conditioning manager Alex Sakadjian. The running session consisted of a challenging circuit of four sets of repeat effort sprints, with the rest time between each set sliced down. After a short amount of rest, the players then saddled up to the lines marked around the boundary and had to cover as much distance as they could in around one minute and 30 seconds. As is typical, half-forward Alex Neal-Bullen was the standout in the running, while second-year utility Bayley Fritsch also ran strongly. Rookie Declan Keilty also impressed with his ability to keep going despite the trying conditions. At the end of the running, second-year forward Charlie Spargo was physically ill as the rest of the players sought the comfort of the shade. The first hour of training consisted of ball work and competitive drills where the defensive team, wearing pink bibs, had to win the ball back off the offensive team despite sporting less numbers. There was also a drill where the players had to rebound the ball outside 50 and hit leading targets Declan Keilty and Joel Smith, who have been training with the forwards. One positive to note was that Corey Maynard being back in full training after a lengthy rehab process following hip surgery during the year. In the three-quarter ground match simulation on a fuller scale, Spargo performed a brilliant piece of defensive play where he closed the space on Michael Hibberd, and then leapt up to smother the footy as the All Australian defender tried to kick over him. In the one motion, Spargo quickly recovered and won possession of the ball before releasing a handball to Fritsch who was darting past and into an open goal. The effort earned a big smile and clap from player/coach performance manager Brendan McCartney who was watching on. There were also a couple of interested onlookers standing outside the boundary including Hawthorn assistant coach Adem Yze as well as Neil Craig, the former Adelaide coach and long-time career-coach at Melbourne, Essendon and Carlton. Craig, now England rugby's high performance manager, reunited with Simon Goodwin while the Demons' coach was on a study tour in the United Kingdom. The Demons' draftees and trade recruits, as well as leaders Nathan Jones, Max Gawn and Tom McDonald, are away in the Northern Territory on an induction camp. Rehab group members Clayton Oliver, Jayden Hunt, Christian Petracca, Tim Smith, Billy Stretch, Jack Viney, Neville Jetta, Jake Melksham, Aaron vandenBerg, Oskar Baker and Oscar McDonald all did light skills as well as completing their running session. Angus Brayshaw was also on light duties, but it's understood he has been sick this week, while Jake Lever is set to return to the track on Monday following a minor procedure on his left knee.